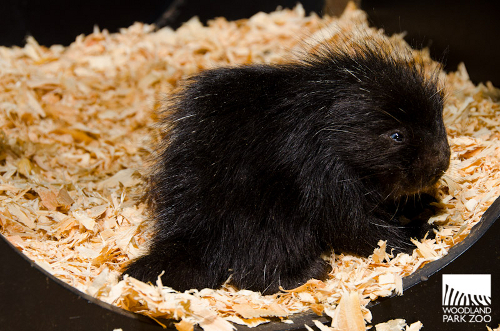 Just when our zookeepers thought the baby boom was at bay, our porcupine pair delivered the zoo’s first ever North American porcupette (the name for a baby porcupine—and yes, the name is as cute as the baby)! Unlike the other recent births, we have to admit: we didn't see this one coming! Our 2-year-old breeding pair, Molly and Oliver, joined Woodland Park Zoo in June 2011 shortly after their April birthdays. At such a young age, zookeepers expected that Oliver was a year shy of sexual maturity. 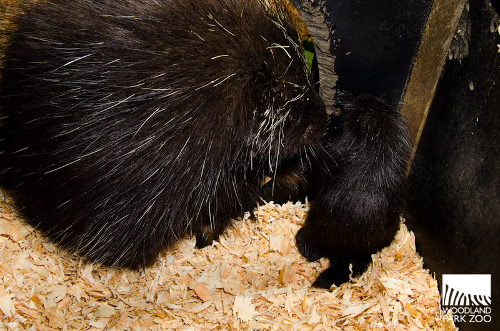 To their surprise, Molly gave birth to a male porcupette on April 18 in the Northern Trail exhibit den! Thinking back, Molly must have become pregnant in September, giving her a seven-month gestation period before birthing the pair’s first baby. 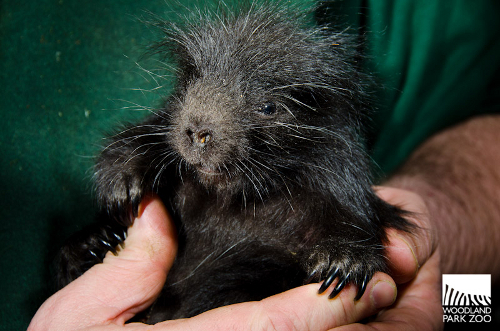 A porcupette is born with a full coat and open eyes, contrasting many of its rodent counterparts. Within hours of birth its soft coat of quills begins to harden, immediately preparing it for protection from predators. The baby becomes active quickly and—as a natural tree dweller—its climbing instincts take hold within weeks of delivery. Climbing makes foraging easier on the young, a skill set it will exercise early in its development as it weans itself from mom and transitions to an herbivorous diet of leaves, twigs and bark. Molly and the newborn live in a den behind the Tundra Center, though Molly sometimes leaves to stretch her legs in their exhibit. 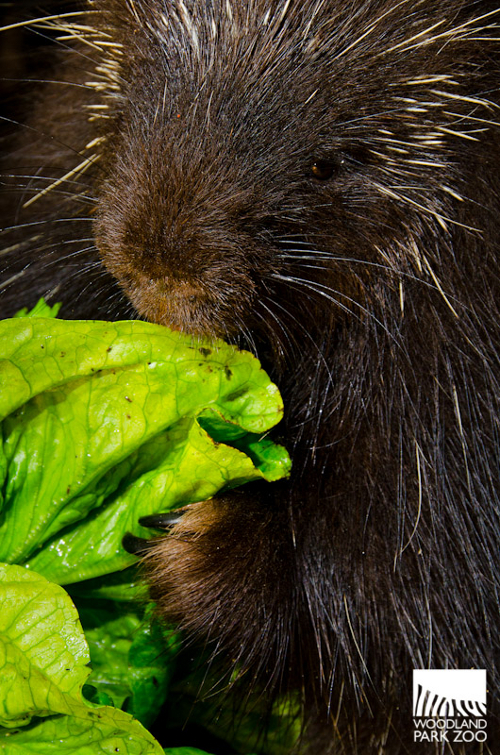 In the wild, a mother porcupine would leave the newborn to nest in a safe area on the ground and she would retreat to the trees for food and shelter. Living at the zoo, Molly has the choice to stay with the baby or take advantage of her unlimited access to their Northern Trail exhibit. In the warmth of their den box, the pair nuzzles close to one another until the porcupette breaks free from her embrace and explores their shared space. Time and time again, mom will swoop her paws beneath his belly and pull him back to her chest for what looks a lot like a porcupine hug. 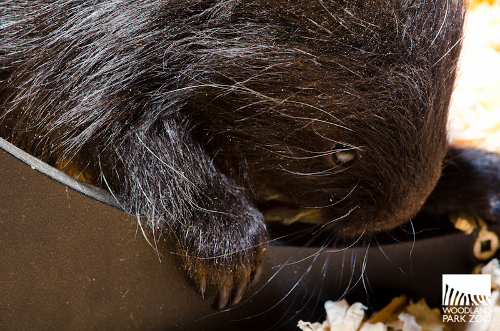 Our zookeepers are keeping a close watch on them in these earliest days, but visitors can expect to see Molly and the porcupette in their exhibit in about two short weeks. So cute! One of those wonderful animals that makes sure that you look but don't touch. How BEAUTIFUL! I have a long standing, very deep relationship with the first creature to be my Guide. Congratulations Molly and Oliver! What a darling addition to the zoo! A cluster, a bloat, a rabble and a mess!